Our painting directly relates to The Four Horsemen of the Apocalypse, who are described in the last book of the New Testament of the Bible, called the Book of Revelation of Jesus Christ to Saint John the Evangelist at 6:1-8. The chapter tells of a "'book'/'scroll' in God's right hand that is sealed with seven seals". The Lamb of God/Lion of Judah (Jesus Christ) opens the first four of the seven seals, which summons forth four allegorical beings who ride out on white, red, black, and pale horses. The four riders are commonly agreed to represent Pestilence, War, Famine, and Death, the harbingers of the Last Judgment. Our example depicts at least three of these Biblical riders. 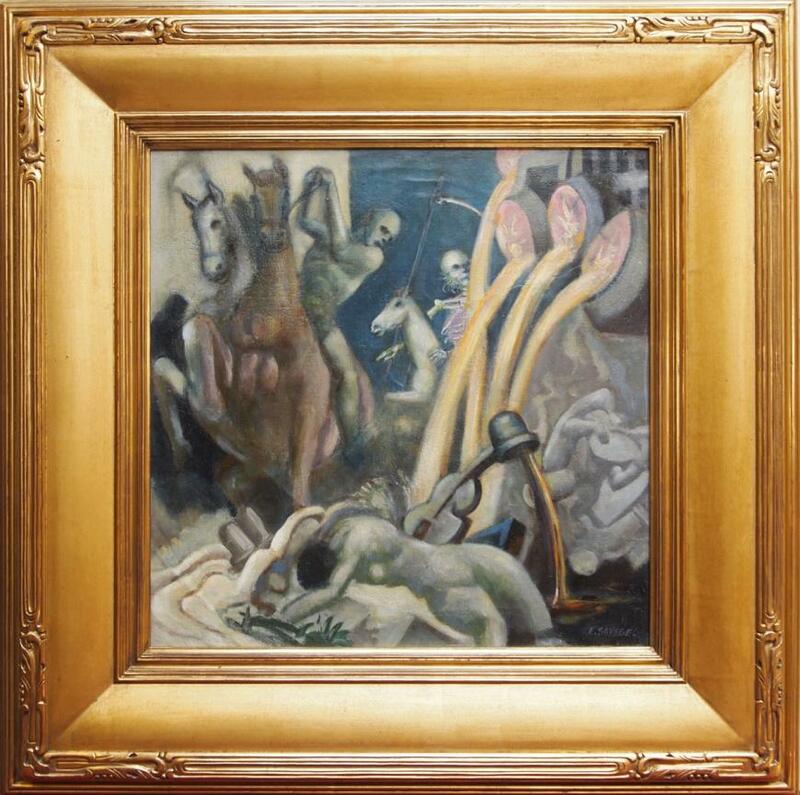 The rider of the reddish brown horse symbolizes War and exacts his slaughter as seen in the ghostly figure of a woman prominently prone in the foreground of the painting. Close by her inert body stands erect a scythe, the most common symbol of Death appropriated from icons of Greek and Roman paganism. A dark or black horse is seen in the background, symbol of Famine. An oboe or stringed instrument without strings may symbolize the loss of music, joy, and even life itself. In the center of the canvas is the rider of the fourth or pale horse whose skeletal rider personifies Death, who purportedly will set a divine apocalypse upon the world as the harbinger of the Last Judgment marking the end of the world. The entire painting is replete with prophetic imagery and Biblical allusions. 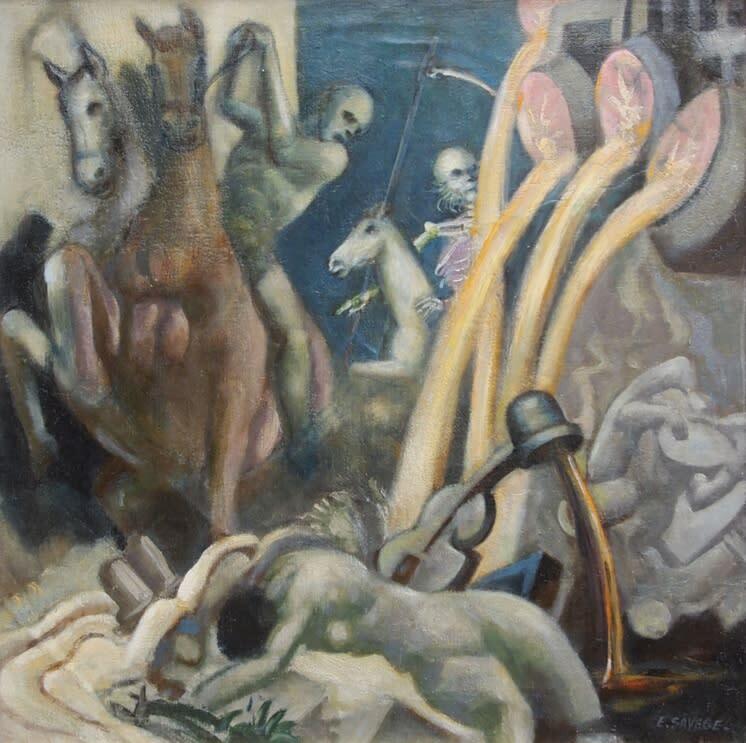 A similar allegorical mural of the Four Horsemen of the Apocalypse by Eugene Savage can be found in the Elks National Veterans Memorial and Headquarters Building in Chicago.